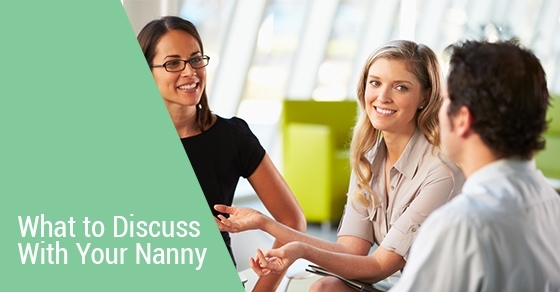 Now that you have completed the hiring process, it is time to have a sit-down conversation with your family’s new nanny to talk about any important things that were not addressed during the interview. Given that this person will be likely living in your home for quite some time, they will understandably need to be treated like part of the close family circle! Families can often be nervous when looking for a nanny, which can make the applicant process feel too formal. Now that your nanny will be a part of your home, it’s essential to discuss any remaining personal topics of interest you feel are important. Every parent has a different way of raising their children, but there is a fine line between letting your nanny voice their input about a particular situation, and crossing boundaries. It’s assumed that you have great trust in your new hire to successfully look after your little ones full-time, but maintaining order in the household means coming to an agreement about things like temper tantrums, discipline, nutrition, and potty training. The last thing you want to do is confuse your children by introducing competing caregiving styles. Do not be afraid to lay out the ground rules with your nanny; many parents think this may make them come off as rude or aggressive, but putting your foot down on certain pet peeves and big no-no’s is vital for the stability and structure of the home. Many parents want no foul language or texting in the presence of their children. These are the kinds of things that you have to make sure the nanny knows not to do when on-duty, especially in the presence of your children. Have you already thought about what you will do in the event your nanny is too ill to watch the kids or when an emergency happens? Getting this issue out of the way early can prevent a lot of stress. Be up front about your expectations and consider keeping in touch with another caregiver in case these instances arise. You will both feel a lot better after having this conversation. It is an invaluable part of the hiring process!